The ideal starting point for excursions into the Iberá marshlands is the village of Colonia Carlos Pellegrini. At the entrance of the village that counts 500 inhabitants you can easily find Irupé Lodge – named after a rare aquatic plant of the wetlands. The panoramic view of our park and the lake right out front, crowded with colourful birds, invites you to explore Argentina’s nature. The Lodge construction on poles ensures a natural and cosy atmosphere for unforgettably relaxing days. 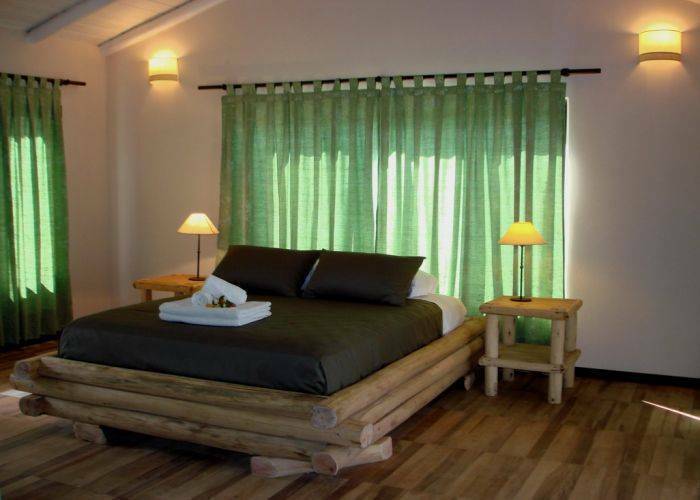 Moreover, the country-style designed and original rooms will help to make your holidays peaceful and exclusive. 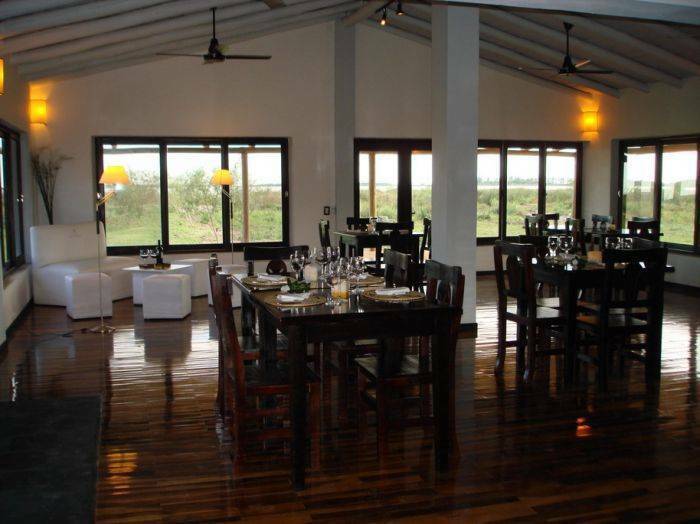 At Irupé Lodge, we offer 8 rooms and a family suite. All the rooms provide a unique view to the Iberá Lake and surprise with large spaces and combination of modern and rustic architecture. 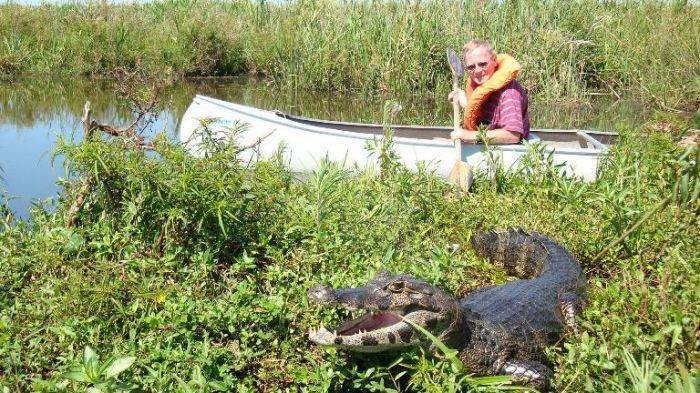 Our swimming pool is nicely fitted into nature at 15 m from the lake shore. The Iberá Lake and marshlands are among the last paradises on earth where visitors can get face to face with caimans, capybaras, swamp deer, howler monkeys and hundreds of birds. Over 350 species of birds live in this virgin landscape. In the heart of Corrientes province you will find the Iberá wetlands. The nature reserve, founded in the year 1983, covers over 13, 000 km² of marsh with over 60 lakes – an area where wild animals are still the protagonists. Calle Yacaré ex N 2. 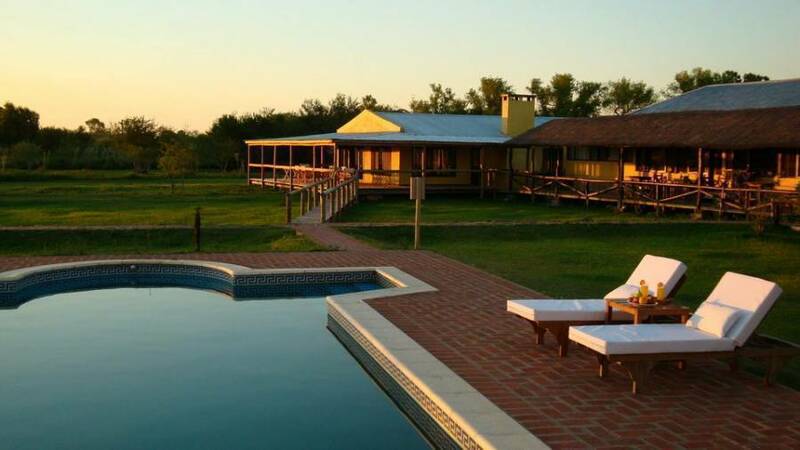 The Irupé Lodge is located on the shore of the Iberá Lake in the village of Colonia Carlos Pellegrini, province of Corrientes, Argentina. By airplane: Domestic flight from Buenos Aires to Posadas, province of Misiones, and from there by our private four wheel drive service to Carlos Pellegrini. By small aircraft: From the international airport of Iguazú, province of Misiones, by our private aircraft to Carlos Pellegrini; with scenic flight over the Iguazú falls. This flight takes 2 hours approximately. Or from the national airport of Posadas to Carlos Pellegrini, overflying the Iberá wetlands. This flight takes 40 minutes approximately. By bus: By overland (night) bus from Buenos Aires to Mercedes, province of Corrientes, and from there by our private four wheel drive service to Carlos Pellegrini. There are other buses bringing you from Salta, Tucuman, Rosario, Corrientes or Iguazú to Posadas or Mercedes. By private car: From Mercedes, province of Corrientes, there are 120 km of gravel road (Ruta 40) in good condition. Four wheel drives are hardly ever necessary. From Posadas, province of Misiones, there are 120 km of pavement and 120 km of gravel road that in wet conditions can only be made by four wheel drives. In Carlos Pellegrini there is no fuel station, please fill up your tank in Mercedes or Gobernador Virasoro.